Now that the heater pipes have been refitted to 7828, I have moved on to the cleaning and polishing of the heater covers. 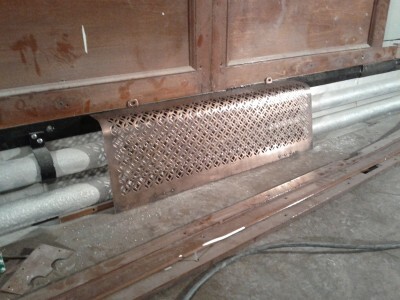 After many years of service and storage, the heater covers were of a blackened appearance, reminiscent of the condition they may have been in during the latter days of the carriage being in service. Gently rubbing the covers with fine steel wool and t-cut has revealed the copper coating on these steel covers, as well as reducing the level of rust found where the coating has worn off. A further coating of waxy furniture polish has also been used, to help reduce further tarnishing of this attractive finish to the decorative metalwork. 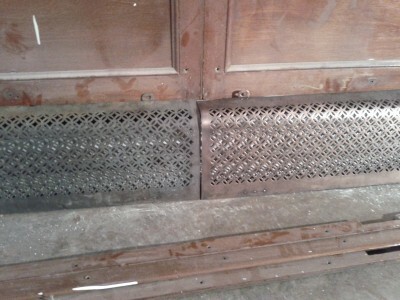 Heater covers showing before and after cleaning and polishing.